From a strategic point of view, you could say that 1918 was a bit boring. The USA was in the war. Tanks had arrived on the battlefield and tactics were evolving beyond massed bayonet charges into machine-guns. At sea, unrestricted submarine warfare was now the norm, and lessons had been learned about convoys. With an accumulation of losses on the battlefield and starvation from the Royal Navy’s blockade, it was clear that Germany was going to lose. The only real question was how long it could hold out. But all that belies the interest from a diving point of view. Having commented that 1917 was the year of the diveable wreck, so was 1918. 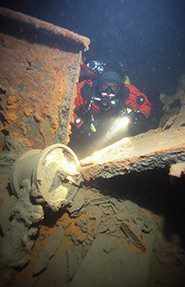 As the war draws to a close, I am going to indulge and write about some of the wrecks from 1918 that I have enjoyed diving and that make good shipwreck stories. Kicking off in the Shetland Islands, on 2 January the steamship Gwladmena was sunk at anchor in a collision with the Fora. The only enemy involved was darkness and crowding of the anchorage. Crowding in the Shetland Islands? The natural anchorage south of Lerwick was an assembly point for convoys, for which the old, slow Gwladmena was carrying a cargo of coal. The water here is non-tidal and typically clear, making the wreck a joy to dive. An interesting anomaly is the top part of the engine, now upside-down and in front of the boilers, perhaps dragged there by another ship’s anchor. The bottom half of the engine remains in the usual place. The propeller-shaft tunnel still retains some of its wooden covering. At the stern the gun is just off the starboard side. Beware of crumbly white chunks of phosphorus. Even a smudge on your gloves will spontaneously ignite when exposed to air. Even further away from our home waters, a trip that really inspired me was to Aland, the chain of islands in the Baltic between Sweden and Finland. Finland had been a Duchy within the Russian Empire since 1809, gaining independence in 1917, though in turmoil with civil conflict through 1918. Sweden could best be described as neutral with Germanic sympathies. The telegraph on the Hindenburg. On 9 March, 1918, the ice-breaker Hindenburg was leading a convoy of German merchant ships home from Sweden, laden with much-needed supplies. Despite Russia being out of the war, a Russian mine frozen in the ice brought the convoy to a halt as it exploded beneath the bow of the Hindenburg. The ice-strengthened hull prevented more damage than many ships would have sustained. All but three of the crew stepped off onto the ice and walked to the next ship in the convoy. At 43m in nearly fresh water with low oxygen and close to freezing, the wreck has barely decayed. As well as shiny features like the steam whistle, I was amazed by little details such as the intact wooden plate-racks in the galley. Operated by the London and South Western railway, the passenger ferry South Western ran a regular service to the Channel Islands. On the night of 16 March, off the back of the Isle of Wight, the South Western was torpedoed by UB59. Firebox on the South Western. At the time I dived the South Western, it was an unknown. 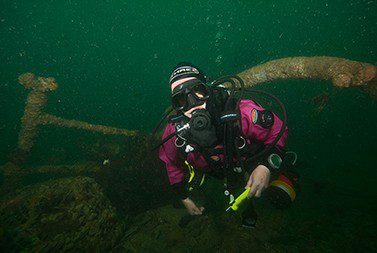 One of the divers found a teaspoon bearing the railway-line crest that unequivocally identified the wreck as the South Western and un-identified a wreck previously thought to be this small steamship. If you have travelled to the Scilly Isles on the Scillonian, you will have some idea of the layout – holds forward, passenger cabin aft, bridge between the two. 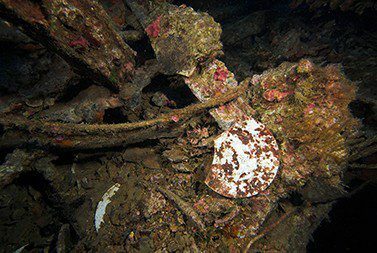 Having previously been an unknown, there is a lot still to find on this wreck. For example, the mount for the 13-pounder stern gun is still there, but not the gun. It could easily be in the sand nearby. For ships not in an escorted convoy, steaming close in to shore was one measure used to avoid U-boats, but that strategy failed to save the 3073-ton Baygitano. On 18 March a single torpedo from UC77 created a popular wreck just to the west of Lyme Regis. Considering that it is only 18m deep on a spring tide and about as close as the South Coast gets to my home in Bristol, I don’t know why it was getting on for a decade into my diving career before I dived the Baygitano. Everyone else had dived it. Many have made their first open-water dives on it. The wreck lies spread across the tide and, like most wrecks in the area, is a fish-magnet. For a wreck that’s so well broken, there is quite a lot to see. 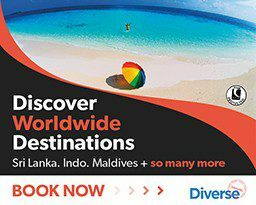 Typically good visibility, shallow water and a grid of hull ribs makes navigation easy, apart from where the aft holds sometimes disappear beneath shifting sands. The role of escorting convoys was often fulfilled by armed trawlers. On 13 May HMT Balfour was escorting a small convoy across the Channel to Dieppe. A tale of errors and heroism began when the steamship Nidd ran over a U-boat. The submarine surfaced astern of the Nidd, and the Balfour turned hard to port to join the action, in the process crossing the Nidd’s bow and becoming impaled. The Balfour’s crew climbed across to the Nidd, with one quick-thinking seaman taking the time to disarm racks of depth-charges first. If left armed they would have blown the bottom out of the Nidd as the Balfour sank. The Nidd’s gunners had meanwhile opened fire on the U-boat, since identified as UB74, and claimed a hit. A near-miss seems more likely, because UB74 was sunk 13 days later off Portland. The next-to-aft starboard gun of the Moldavia remains in place, pointing to the surface. Steaming in convoy, the armed merchant cruiser HMS Moldavia was torpedoed by UB57 on 20 May. The wreck now rests in 50m off Sussex. 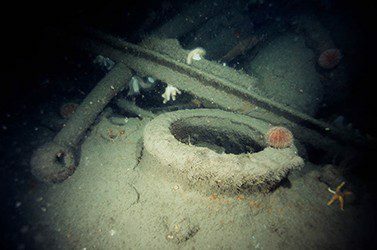 As a P&O liner converted to a cruiser, the wreck provides almost everything divers love: big propulsion machinery, cabins with portholes, bathrooms with all their fittings, and no fewer than eight 6in guns. For me, the Moldavia was the ultimate Wreck Tour project, involving locating all the guns and filling in all sorts of tiny details. 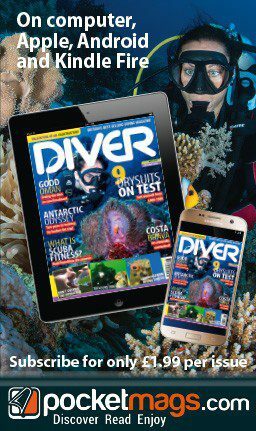 A few years ago the Editor asked me to write about my top three dives, and I had no hesitation in picking one of those on the Moldavia. Just six days after torpedoing the Moldavia, UB57 put a torpedo into another P&O liner, the Kyarra, which was serving as a hospital ship. With shuttle boats operating from Swanage, charters from Poole and easy launching for RIBs, the Kyarra is for many the go-to dive. Regulars have their favourite spots in which to forage and photographers have their favourite spots for taking pictures. 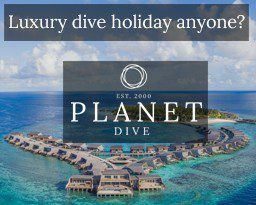 There have been times in my diving career when a buddy and I have jumped in a car and had a weekend of four dives on the Kyarra, with dregs on Swanage pier in-between. For me it is an ideal wreck for conger eels, lobsters and swirling shoals of bib. As the tide picks up these striped relatives of cod move tighter inside the wreck, providing a fish soup through which to swim. At half the tonnage and two-thirds of the length of the Moldavia, and shallower at 30m, the Kyarra is a wreck that can be covered bow-to-stern in one dive without rushing. The deadly UB57 lasted only two months more. On 13 August her last victim was the City of Brisbane off Sussex. A day later, UB57 struck a mine on the way back to Zeebrugge. On 31 May, U90 entered Village Bay on St Kilda and fired 72 shells to destroy the Royal Navy signal station and associated stores building. The shelling was selective, causing no damage to any of the islanders’ homes. Only one sheep was killed. U90’s Captain, Walter Remy, must have had a liking for the Scottish islands, because another of his exploits was to regularly stop off at North Rona for fresh supplies of mutton. The British response was to install a 4in gun overlooking the bay, but the gun was never fired in anger. 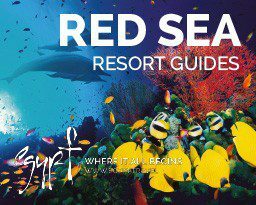 It is still there, and has become one of the shore attractions for visiting divers. On 3 August the Berwind was the first of two ships torpedoed by UB88 off the west of Brittany. The Lake Portage soon followed. 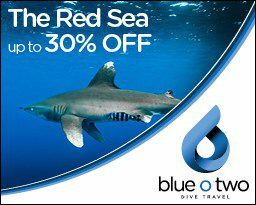 The two wrecks are only a few miles apart, and I was fortunate to dive them on successive days in perfect conditions, with flat sea and stunning visibility. 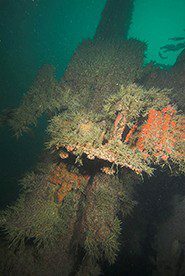 Like many wrecks exposed to the west, both ships are now skeletons on the seabed, the Berwind at 40m and the Lake Portage 10m deeper. As the Berwind is the larger of the two wrecks, that works out quite well. Both are typical four-hold steamships. The Berwind has a gun at the bow and the Lake Portage was unarmed. In among all the U-boat activity, the usual shipping accidents continued. On 10 August in a typical summer sea fog off east Devon, the 1439-ton Bretagne was sunk in a collision with the barque Renee Marthe. 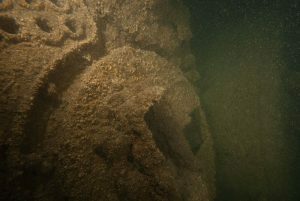 The wreck is upright and intact on a 30m seabed. 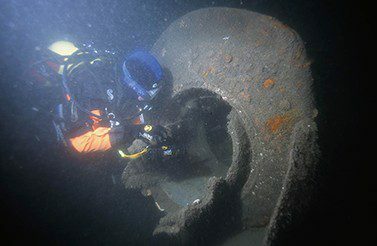 Beneath the stern, the iron propeller remains in place. On the starboard side of the bow, the remains of a small cabin cover an anemone-encrusted toilet. For those looking for a warmer summer than that in our home waters, also on 10 August the French liner and troopship Polynesien was torpedoed by UC22 to the east of Malta. Broken plates in the galley area of Le Polynesien. The wreck is at the shallower end of trimix territory at 65m to the seabed. The upper parts are just within air range, but I wouldn’t risk it. A current typically sweeps across the wreck from the west as water flows past Malta into the eastern basin of the Mediterranean. The hull and railings of the ship are encrusted with sponges and provide plenty of colour for photographs. Amidships to the port side are piles of crockery from the dining-room. Then, a little forward, is one of the most beautiful rows of urinals you could ever dive. Hospital ship Rewa torpedoed in Bristol Channel. Turkish Dead Sea flotilla captured by Arab camel cavalry. Royal Navy loses two submarines and others damaged by collision in the so-called Battle of May Island. Tuscania torpedoed off Irish coast while carrying US troops. German destroyer raid on Straits of Dover sinks many armed trawlers and small vessels. The raider Wolff returns to Germany. Armed merchant cruiser HMS Calgarian torpedoed and sunk off Irish coast. British submarines at Helsingfors (Finland) scuttled to prevent capture. Zeebrugge raid attempts to block port used as U-boat base. U90 shells St Kilda (Outer Hebrides). U-boats operating in US coastal waters. Austro-Hungarian battleship St Istvan sunk by Italian torpedo-boat. Hospital ship Warilda torpedoed in English Channel. The Union-Castle liner Galway Castle torpedoed without warning in the Channel, with 154 lives lost. Policy of unrestricted U-boat warfare suspended. Mutiny on German battleships prevents suicide sortie against British fleet. Austro-Hungarian battleship Viribus Unitis sunk in Pola harbour by Italian charioteers. Kiel Mutiny – the entire German surface fleet mutinies. HMS Campania sunk in collision in Firth of Forth. Minesweeper HMS Ascot is the last British warship torpedoed and sunk during WW1. German High Seas Fleet arrives at Rosyth, prior to being interred at Scapa Flow. Aircraft raid on London kills 67 and injures 166. One German plane shot down. Martial law declared in Berlin and Hamburg. Representation of the People Act extends right to vote to all men over 21 and women over 30 with £5 worth of assets. Treaty negotiations between Germany and Soviet Russia concluded. German spring offensive retakes Somme. Paris shelled by long-range gun “Big Bertha” from 75 miles away. Foch appointed Supreme Allied Commander on the Western Front. Royal Flying Corps and Royal Naval Air Service merged to create Royal Air Service. Air ace Manfred von Richthofen, the “Red Baron”, killed in dogfight. Guatemala declares war on Germany. Gavrilo Princip, assassin of Archduke Ferdinand, dies in prison of tuberculosis. Nicaragua declares war on Germany. Costa Rica declares war on Germany. Trotsky becomes leader of communists in Russia. Ernest Hemingway wounded in Italy while working as an ambulance driver. Haiti declares war on Germany. Tsar Nicholas and family executed. British Expeditionary Force lands in Archangel to support White Russian forces against Bolsheviks. Last zeppelin raid on England repulsed with 70 being destroyed. 450 massed tanks enable British attack at Amiens to advance. German offensive defeated. German forces retreat to the Hindenburg Line. First Allied breakthrough of Hindenburg Line. Trieste captured by Allies. Austria-Hungary concludes armistice negotiations. Germany negotiates an armistice with the Allies in Ferdinand Foch’s railway carriage headquarters at Compiegne. So many coastal vessels fell victim to coastal U-boats or the mines they laid, but the U-boats didn’t get it all their own way. On 26 August off Whitby, UC70 had the distinction of becoming the first U-boat to be sunk by air attack from a fixed-wing aircraft. The U-boat had probably already suffered minor damage in a minefield and was leaking a slick of oil. In calm summer conditions, this was spotted by a patrolling Blackburn Kangaroo bomber. The aircrew followed the slick until they could see the U-boat below, and dropped their bombs. A gush of bubbles and more oil followed, drawing a nearby destroyer to the scene to follow up with depth-charges. UC70 was my first U-boat of this class, and a revelation. Credit to the Germans: with much of the machinery outside the pressure-hull, U-boats generally make more interesting dives than their British equivalents. Approaching the North Channel in a gale on 6 October, the liners Otranto and Kasmir were leading two columns of a troop convoy from America. In bad visibility, the breakers were sighted two miles ahead on the rocky coast of Islay. The Kasmir turned hard to starboard. The Otranto turned hard to port across the bow of the Kasmir and was fatally wounded. An escorting destroyer came alongside the Otranto and troops attempted to jump across. As many fell between the crashing hulls as actually made the jump. The Otranto settled onto the rocky seabed a few hundred metres from shore. The ship was rapidly breaking up. Of the remaining troops and crew, only 16 made it to shore. The wreck is spread across rocky ridges at 10m, well-broken by winter storms. Six boilers stand in two raggedy lines, with debris from the engine-room behind them. Just outside Strangford Lough in Northern Ireland, the steamship Hunsdon was torpedoed by UB92 on 18 October. The Hunsdon entered the war as the Arnfried of the Hamburg-America line, captured by British forces in German West Africa and pressed into British use. Water tank alongside the engine of the Hunsdon. 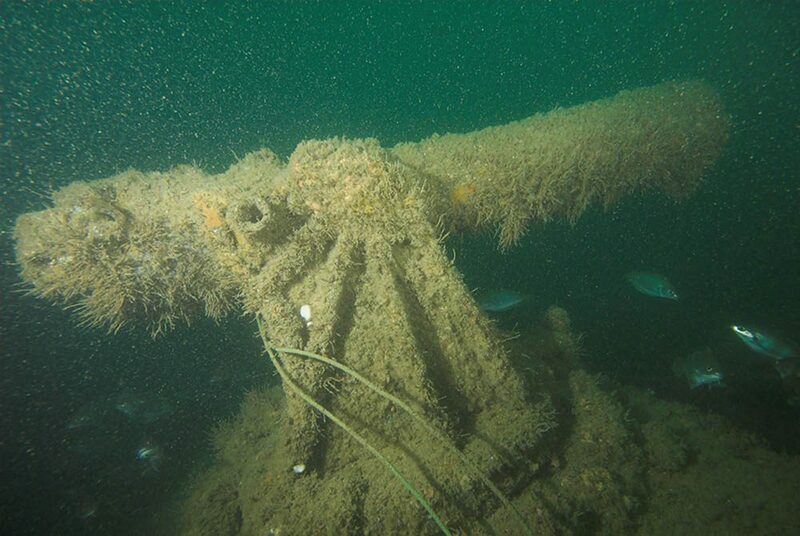 With a general depth of 35m and out of the tide, the Hunsdon is the easiest of the deeper wrecks in the area. The full wreck can be covered without getting too far into decompression. Highlights are the big engine and boilers, and the gun at the stern. Given another month, the Hunsdon would have survived the war. Irish pub rumours assigned her torpedoing to espionage in Dublin and a mission of revenge. Occam’s Razor suggests that the Hunsdon was merely unfortunate when steaming through a well-established U-boat stalking ground. Since running back to safety after the Battle of Jutland in 1916, the sailors of the German fleet had been growing increasingly disaffected with their living conditions, poor rations and over-zealous discipline. Naval command was torn between providing crews for U-boats and maintaining the fleet in readiness for a last big battle – a grand gesture of admirals’ pride for which sailors just couldn’t see the point. On 28 October disobedience and small strikes escalated and were mismanaged until, on 3 November, troops opened fire on protesting sailors and townsfolk in Kiel. By 4 November, soldiers were siding with the mutineers and townsfolk. Political agitators took advantage of the mutiny to form workers’ councils along the same lines as those in the Russian Revolution the year before. By 6 November, Hamburg was also controlled by protesters. If it were not for the Kaiser’s abdication and the Armistice, Germany could have been overtaken by a communist revolution. limpet-mines to the battleship Viribus Unitis. The mines exploded at dawn, sinking the battleship with an admiral aboard and a large part of the crew. The ship was flying the Croatian flag at the time, having just been donated to the new state that would soon become Yugoslavia, to prevent her being handed over to the Allies with the Armistice. But she was still in an Austro-Hungarian base, and still carried an Austro-Hungarian crew. On 9 November Kaiser Wilhelm abdicated and went into exile in the Netherlands. On 11 November at 11am French time, the Armistice came into force and fighting ceased. The actual Treaty of Versailles was not signed until 28 June, 1919, and didn’t take effect until 10 January, 1920. The Great War was over, but its legacy for divers was not. Much of significance was still to happen in 1919 and beyond, and we’ll reflect that next year. Treaty of Versailles comes into effect. War officially over.